Meat-free in no way means flavor-free. This list of the best vegetarian recipes will clearly show this to be the case. In this list, we have compiled some of the best and tastiest vegetarian recipes out there. These dishes are going to cover a range of types of foods and will not only be delicious, but easy to make as well. With everything from breakfast to dinner covered, you are sure to have plenty of options to choose from. 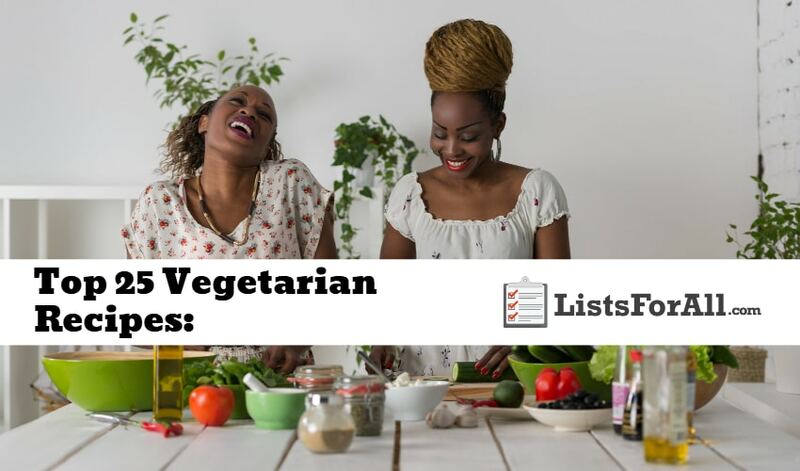 So whether you are trying out the vegetarian lifestyle or have been doing it for years, the recipes on this list will have you covered! For even more cooking lists, visit our list of the best vegan recipes and our list of the best cooking blogs. And, if you have your own favorite vegetarian recipe, be sure to let us know what it is in the comments section below. 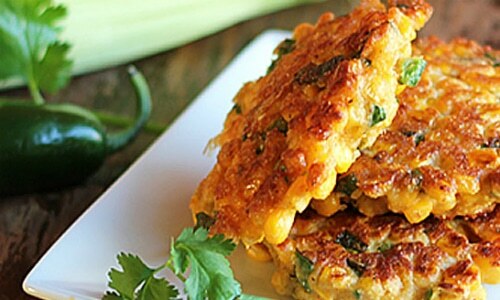 About This Vegetarian Recipe: A great summertime meal or side, this jalapeno corn fritter recipe is packed full of flavor. The cilantro, corn, and jalapenos keep the dish fresh, while the cornmeal provides some substance. These fritters are not overly hot or spicy either as the recipe will allow you to be able to adjust the spiciness and hotness to your liking. About This Vegetarian Recipe: This feta dip recipe is going to call for fresh ingredients like tomatoes, cucumbers, and feta. All ingredients that are typically found in Greek recipes. This recipe not only looks great and tastes great, but it also comes together easily and quickly. Add some crusty bread or crackers for dipping, and you have the perfect appetizer. About This Vegetarian Recipe: Part breakfast, part dessert, this apple pie sandwich recipe is a hit no matter the time of day. Utilizing a French toast inspired bread, the filling of spiced apples is delicious and perfect for when you have a lot of apples on hand. With this recipe only taking a total of 30 minutes to complete, you won’t have to wait long to enjoy this tasty dish. 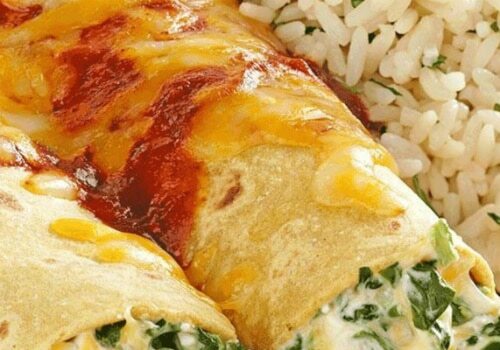 About This Vegetarian Recipe: If you are craving Mexican food, these spinach enchiladas are going to be just the ticket. The ricotta cheese and spinach combine perfectly for a cheesy nutritious dish. With only a 20 minute prep and 20 minute cook time as well, these spinach enchiladas don’t require much time to make either. So the next time you are in the mood for a tasty Mexican dish, give this recipe a try. About This Vegetarian Recipe: An excellent side dish, these scalloped potatoes go well with so many things. 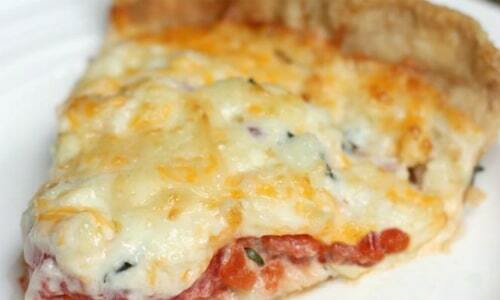 They will be loved by anyone that enjoys cheesy potato goodness, and they are easy to make. 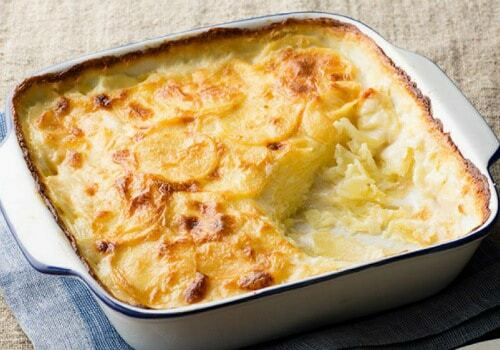 So whether it is for a holiday meal or a typical midweek dinner, give these scalloped potatoes a try. About This Vegetarian Recipe: Flavorful, healthy, and simple to make, the trifecta of a great homemade dinner. 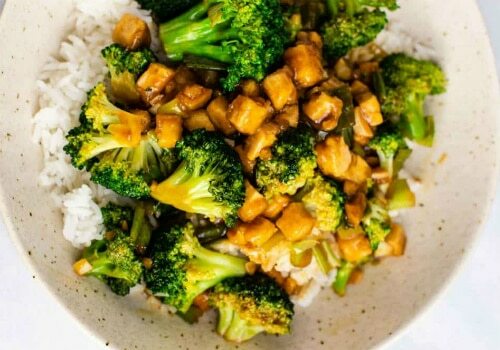 This broccoli tofu stir fry dish is going to pass all there of these with ease. Also, if you enjoy leftovers, this dish reheats well the following day. So make extra and enjoy stir fry two days in a row. This stir fry dinner is so tasty that it will have you forgetting all about takeout. About This Vegetarian Recipe: Any time you can prepare a great tasting meal in advance, you are already ahead of the game. 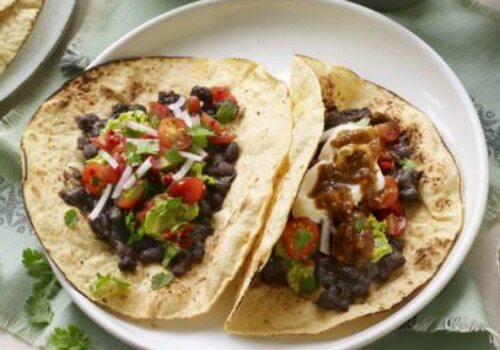 These zesty black bean tacos are going to allow you to do just that. Outside of the preparation though, this meal is also a hit on its own. With garlic, chipotle, lime, and more all coming together perfectly, your taste buds will thank you for this dish. So give this taco recipe a try next Taco Tuesday or any time that you are craving tacos. 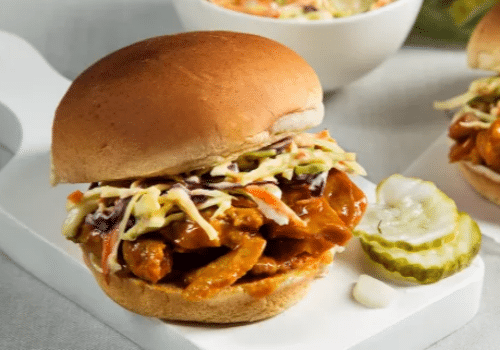 About This Vegetarian Recipe: You may not equate barbecue with a vegan dish, but with this recipe, you will be able to have Carolina-Style barbecue sandwiches. Highlighting seitan as the meat substitute, the barbecue sauce mixture is the real star of the dish. With cole slaw as a topper, this barbecue sandwich is one that you are going to come back to regularly. About This Vegetarian Recipe: For a sandwich that will have you thinking that you are in the Italian countryside, these mozzarella and tomato sandwiches are not to be missed. Perfect for a light lunch, these sandwiches are full of flavor. 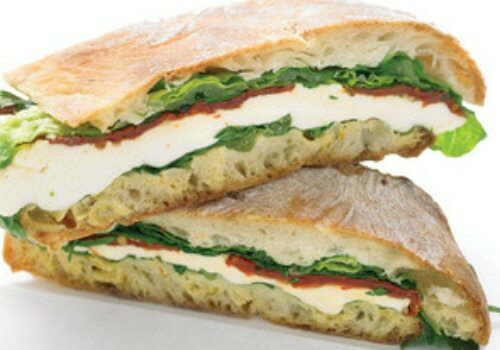 Mozzarella, tomato, romaine lettuce, and several other ingredients make up the inside of the sandwich. Holding all of this goodness together is a delicious toasted ciabatta bread. So the next time you are looking for a warm sandwich full of flavor, give this recipe a try. 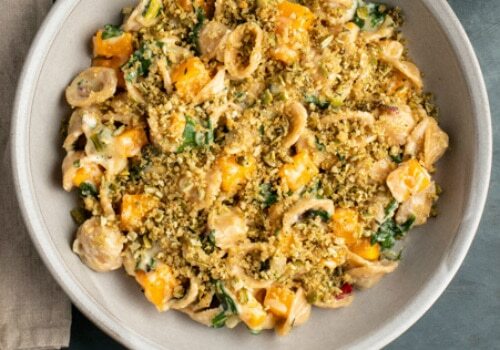 About This Vegetarian Recipe: This pasta is going to pack a ton of flavor. And, because it highlights broccoli and cauliflower, you will be able to make a solid dent in your veggie intake for the day. Along with being great tasting, this dish is easy to prepare in large portions. So whether you have a big family, are entertaining, or enjoy leftovers, this dish can be multiplied. About This Vegetarian Recipe: If you are looking for a dish that is also going to pack a ton of nutrition, look no further than one of these power bowls. 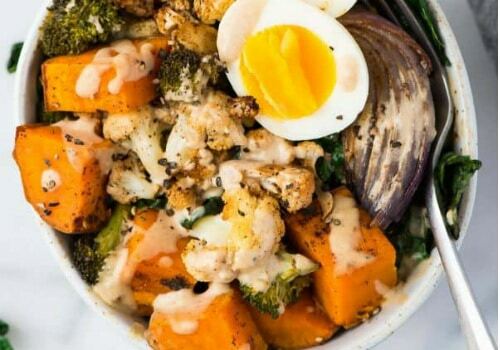 With a variety of roasted veggies, a soft boiled egg, and a whole30 dressing, this recipe is equal parts flavor and good for you. And, with the ability to sub in and out different ingredients, you can keep this dish new and fresh each time. 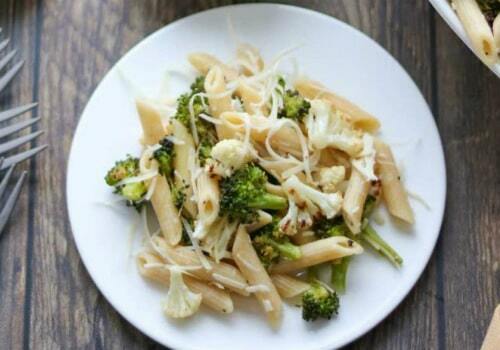 About This Vegetarian Recipe: This vegetarian recipe is going to improve on the classic mac and cheese dish. The added roasted butternut squash is going to really bulk up the dish and add a ton of extra flavor as well. It will turn the side dish of mac and cheese into a main course that you will want to add to your regular dinner rotation. 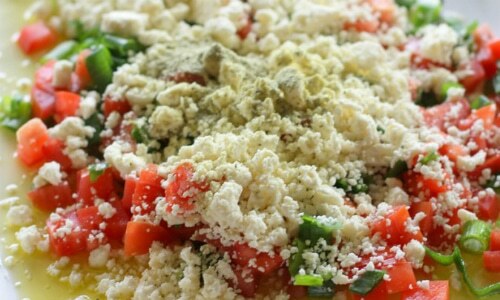 About This Vegetarian Recipe: If you love pizza, you are really going to love this vegetarian recipe. Marinara sauce and mozzarella are going to make up the base, but the real stars of the pizza are the veggies. 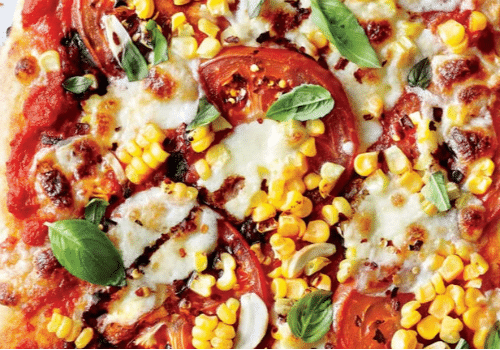 This pizza recipe is going to call for sweet summer vegetable toppings like fresh tomatoes and corn. And then after everything comes out baked to perfection, you are going to drizzle it all in a balsamic glaze. About This Vegetarian Recipe: This dish is perfect for a family dinner or if you are looking to do a little meal prepping for the week. 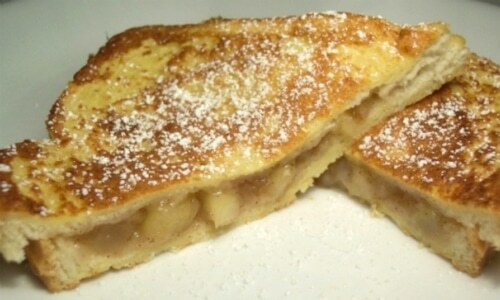 It can also be made ahead of time as well as frozen, which is great for those with a busy schedule. 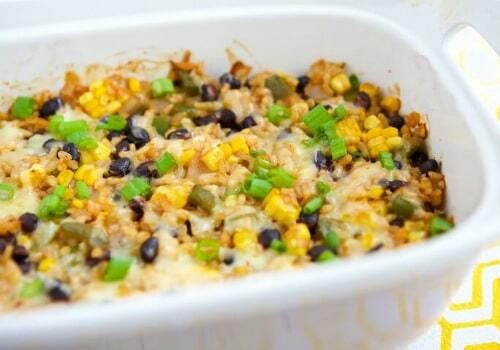 Short grain rice and black beans make up the base of this dish but also highlighted are ingredients like corn, green pepper, and pinto beans. All of these ingredients are going to come together for a flavorful and filling dish. About This Vegetarian Recipe: This chili recipe is not only going to be tasty but also very hearty and filling. 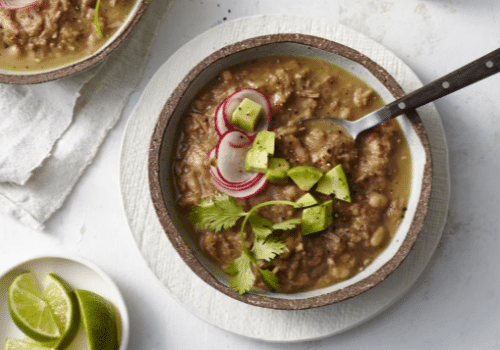 Jackfruit is going to be the perfect meat substitute for this dish and will have you saying, “I can’t believe it’s vegan chili.” So if you are looking for a cold weather chili recipe, this should be the one. 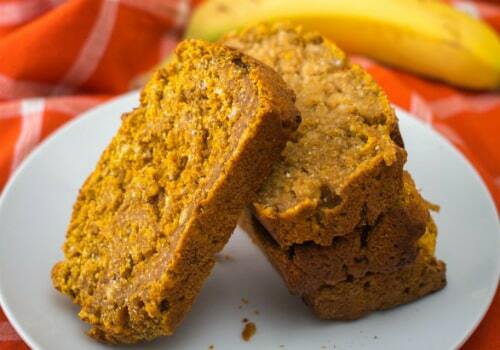 About This Vegetarian Recipe: Fall or not, this pumpkin bread is tasty and should be enjoyed regularly. This recipe is going to allow for moist pumpkin bread that packs a ton of flavor. And, with the ability to add in nuts, dried fruits, etc. you have the ability to customize this bread how you best like it. About This Vegetarian Recipe: Experienced eaters know that breakfast can be enjoyed at any time of the day. So whether it is breakfast time or not, this vegetarian breakfast burrito is fair game. Eggs, hash browns, and black beans are going to make up the base. While cilantro, avocado, green onion, and several other ingredients really provide the flavoring. 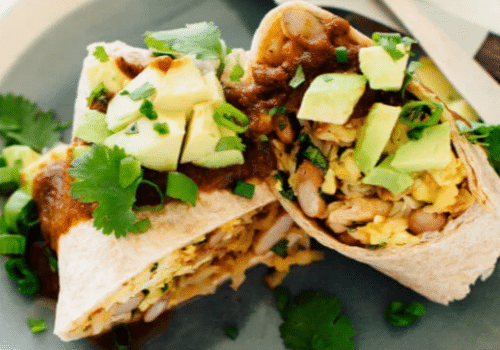 So whether it is breakfast time or not, give this breakfast burrito a try. About This Vegetarian Recipe: You may have had a loaded baked potato before, but not like this. 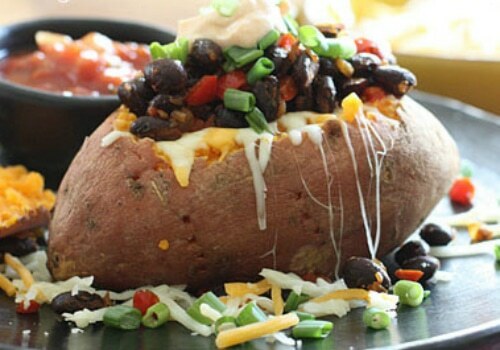 With Greek yogurt, taco seasoning, peppers, black beans, salsa, cheese, and so much more, this recipe brings a whole new meaning to the word “loaded.” With so many toppings and ingredients, this loaded potato just went from side dish to the main course. About This Vegetarian Recipe: Garlic. Cheese. What more is there to say? 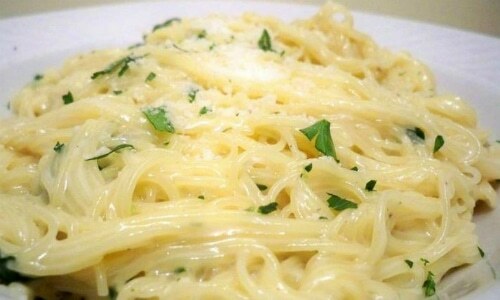 How about a rich, creamy garlic pasta main dish that kids and adults will both enjoy? Throw in some garlic bread and a salad, and you have a complete meal on your hands. About This Vegetarian Recipe: On their own fried green tomatoes and grits are delicious. Now combine them with yummy basil and goat cheese, and you have a complete game changer. 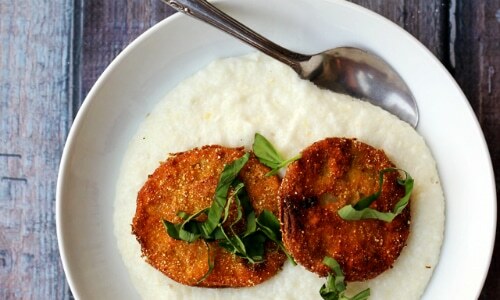 This fried green tomatoes over grits recipe is a true southern classic. It is perfect in the summer or for a light lunch. About This Vegetarian Recipe: Another southern tradition, this tomato pie recipe is perfect for when you have a lot of tomatoes. Be prepared though, a baked pie crust layered with fresh tomatoes, basil, onion, and a delicious cheese mixture will leave you running for more tomatoes! If you enjoy tomatoes, this recipe is going to be a must. 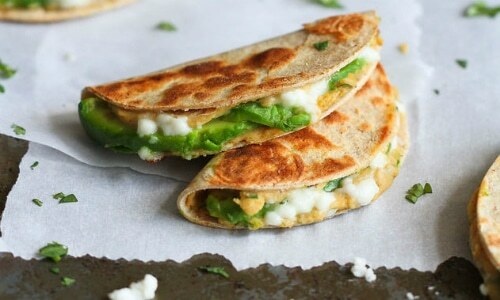 About This Vegetarian Recipe: Quick and easy to make, these avocado and hummus quesadillas are both healthy and satisfying. Cheese and veggies also work well with this quesadilla recipe, so put your own stamp on this dish by creating a custom quesadilla. About This Vegetarian Recipe: With the addition of lemon, the classic cucumber and cream cheese sandwich rises to a whole new level. 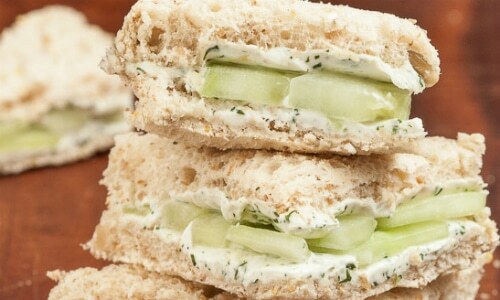 This lemon cucumber cream cheese sandwich is perfect for lunch, a snack, or as a finger-food at parties. Pretty much anywhere and at any time this sandwich is sure to be a hit. 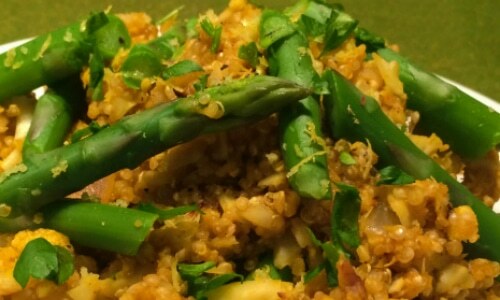 About This Vegetarian Recipe: Filling without being heavy, this lemon asparagus quinoa risotto is healthy and delicious. This recipe is also going to allow you to get creative as well with the base. If quinoa is not your favorite, you can also use barley, brown rice, brown lentils or buckwheat. So get creative with this dish and find the combination that works best for you. 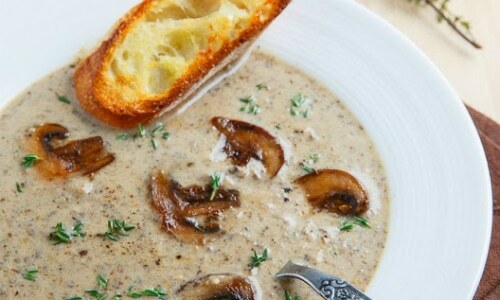 About This Vegetarian Recipe: This creamy roasted mushroom and brie soup is perfect for soup lovers. It is going to be rich, hearty, and perfect for a cold evening. The addition of brie in this soup is what is really going to set it apart. Add in some perfectly toasted bread to dip in the soup, and it doesn’t get much better. After reading this list, it is clear to see that there are a number of delicious tasting vegetarian dishes to choose from. Dishes that would even make some meat eaters jealous. So start trying some of these great vegetarian dishes and then add them to your regular rotation. Do you need any of the kitchen tools required to make one of these dishes? Visit our list of the best kitchen tools for everything that your kitchen will need. We would love to hear your feedback in the comments below on any of these dishes. So please let us know how any of these dishes turned out for you.